SOLID INVESTMENT ACROSS FROM THE OCEAN! So many options for this one of a kind, rare property. 190 & 192 Cliff Ave, two residences with an approximately 700 sf roof deck with panoramic, unobstructed ocean views. 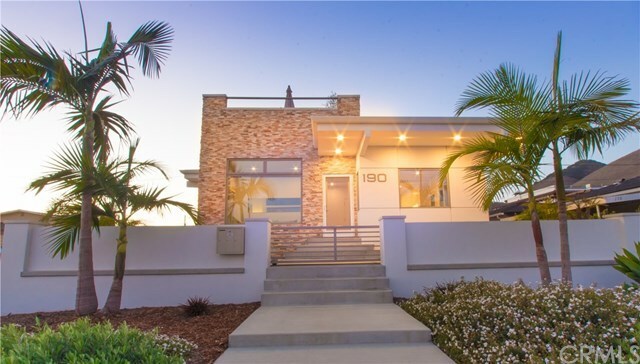 Newly remodeled and designed by prominent local architect Warren Hamrick, this Contemporary beauty sits across from the ocean in the heart of Shell Beach. Panoramic ocean & coastline views are breathtaking as well as the beautiful mountain, park & city views. The home features exceptional use of outdoor living featuring a very spacious, panoramic roof top deck with covered balcony and gated front courtyard patio. Custom built, this home is the ultimate beach home with hardwood floors, Quartzite countertops in the kitchen, owned solar system, security system with multiple camera coverage, open beam ceilings, wall mounted fireplaces in main house and guest unit, two tankless water heaters and a wall of windows facing the ocean that showcase the amazing sunrise and colorful sunset skies. This awesome home has a rare 1 bedroom guest unit with parking and separate meters. Live in the main house and rent out guest quarters or use guest quarters as a vacation getaway and rent the main house. Highly desirable corporate rental, so many great possibilities with this property. Home can be easily modified to be one large home. A short stroll to restaurants, coffee houses, hiking, parks and multiple beach accesses.